Throughout these months we have had memory verses each week. Whether you have tried to memorize these verses or not, I hope you’ve benefited from the visuals I’ve made. The goal is to better understand the meaning of the verse with these graphical representations, or to at least make them easier to remember. 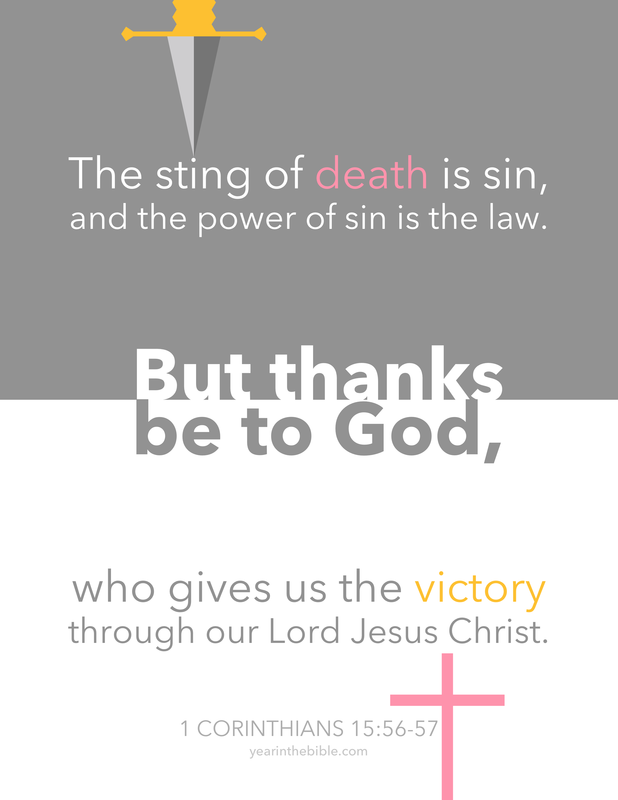 Now at the end of 1 Corinthians we have our final Bible visualization. A theme of 1 Corinthians has been love. Love is what will right the wrongs of the church and love should be the theme of the Christian life. So it no wonder that in his closing words to Corinth that Paul would encourage them to live in love. 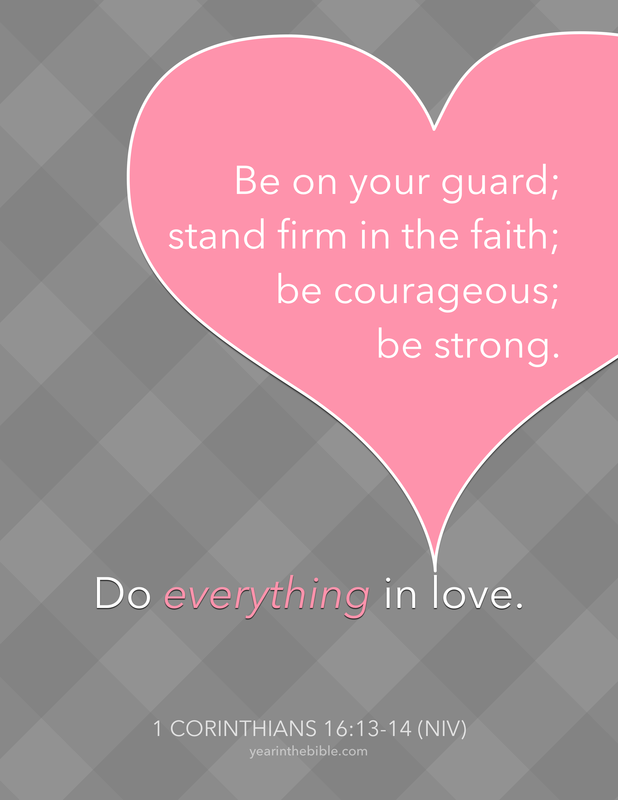 He says, “Be on guard; stand firm in the faith; be courageous; be strong.” Then follows that by saying do everything–and I would take that as including the above list–in love. For the Christian, there is no way of being strong that is not a loving strength. There is no courage apart from love. All we do should be done in the love we receive from God and should have love as its goal. To help you memorize that, here is the final visual. Enjoy. To review the past Bible Visualizations from 1 Corinthians go here. We read in Paul’s final words his concern for the other churches and ministers. He has a few more instructions for them. And if nothing else, we’re reminded that this is a letter. If a pastor were to write to a church and include no personal remarks, I’m not sure how that would go over. Paul doesn’t just care about the truth of Jesus Christ, he cares about the church. And to care about the church is to care about the individual members that constitute it. The issues presented in this letter are deeply personal to him because these people are a personal concern. So as you read this or other letters of Paul, don’t forget they are letters. They were not printed out with verse numbers and chapters, all with their own subheadings. They were written by hand and sent from believer to believer as a personal letter to build up, teach, and encourage the church. He says “therefore” showing that this line is building upon the truth of the resurrection and our future hope. Because we will be made new in Christ, we now work for the Lord in all we do. The Christian hope does not remove our responsibilities for this life. Rather it should give us all the more reason to work for Christ’s kingdom today, knowing that such labor will never be in vain. This reading plan through 1 Corinthians has been intentionally slow and many weeks have been quite short. The aim wasn’t to allow for the study and reflection to be quick and easy, rather to give time to review and reread, and gain great depth from this wonderful letter of Paul. As we near the end of Paul’s letter I’d highly encourage you to start over. Go back to chapter one and begin again. Read it a couple times even. This coming Sunday starts the final week of readings and the more we can see the whole of 1 Corinthians and then combine that with the close focus we’ve put on each week’s assignment, the better understanding we’ll walk away with when we reach Paul’s final words. Going back through it you may find that the text is much easier to understand. You may see recurring themes that hadn’t stood out on your first read through. I’m not saying you’ll necessarily be an expert by now, but the more you study and pray through this book, the more God is going to use it. Five months can seem like a flash, but what we read back in June may seem far off. Refamiliarize yourself with the whole and be reminded that while there are sixteen chapters, 1 Corinthians is still just one letter. Continuing the topic of resurrection in chapter 15, Paul voices some of the questions or objections that he has heard to this fantastic notion of the dead being raised. Some have asked how this happens? If in fact it does happen, what sort of body will they have? Paul uses several mini-parables to answer this, looking at seeds, animals, and celestial bodies. Even with his concise illustrations this can still be a difficult passage. Or maybe I should say, of course it is a difficult passage. Resurrection is not an easy thing to believe in. In a very literal sense, it’s not natural for us. Nature allows for birth and death, but no more. The resurrection is supernatural. For such an amazing concept, maybe watching a short video will help. Here’s NT Wright on resurrection and its understanding in the first century. It’s not very long (6 min), but it is part of a much longer video, if you’re feeling adventurous. We’re back to having a Bible visualization this week. (I’m still trying to catch up on last week.) 1 Corinthians 15 is a powerful chapter on the resurrection of Jesus Christ and what that means for us as well. Paul puts it succinctly near the end as he lays out a great contrast. We all face death and are under the power of sin. The law could do nothing to save us from such a fate. Then Paul uses that wonderful, good news-filled, gracious phrase: but God. Or at least in this section, “but thanks be to God.” Death is not the end nor does sin have the power. God, through Jesus Christ, gives us the victory over such things in his death and resurrection. I have been gone quite a bit over the last two weeks and have not managed to do much more than put up the Bible study handouts for the readings. In the meantime we’ve had some great bits in 1 Corinthians and rather than brush over them and move right along to what we’ll start tomorrow, I wanted to put out a call for any questions. Was there some standout part of these last two weeks of readings that you have a question about? Was there something that you weren’t quite sure about? Maybe you just want to see if there is more to know about a section that you’ve always liked. I can’t do it all this week, but I’d love to have a few suggestions that can be addressed. So if you have one–go back and see if you had something underlined or had written in a little question mark in the margins–let me know. Either email me, leave it in the comments, or some other third way of reaching me. I look forward to the feedback! Paul structures the section we read this week in two parts, and the second flows from the first. First we look to Jesus Christ and his resurrection. Paul mentions what here is of "first importance." These are core events to the Christian faith, and without them–without Christ then the we would have nothing else. But since we do have such a hope that has been passed on to Paul, to the Corinthians, and through generations to us, then we see in what follows that Christ’s resurrection provides a way for our resurrection. Christ’s resurrection is like the bottom Jenga piece that if you remove, everything else falls apart. If Christ is not raised from the dead, as Paul writes, "we are of all people most to be pitied."